Can your headshot make a total stranger want to hire you? If your current headshot is a little too glum chum, outdated, or simply not working for you like it should, then you’re going to want to read every last word of this article. Seriously, it IS that important. As a real estate agent, a professional – and most importantly, likable – headshot is critical to your success. It’s the first impression you make on a prospect. It’s how you build credibility and authority in the market. And it’s crucial in sending out the right message for your brand. Still don’t believe how important the perfect headshot is? Point is, you want to appear likable – and the right headshot can go a long way in making that happen. 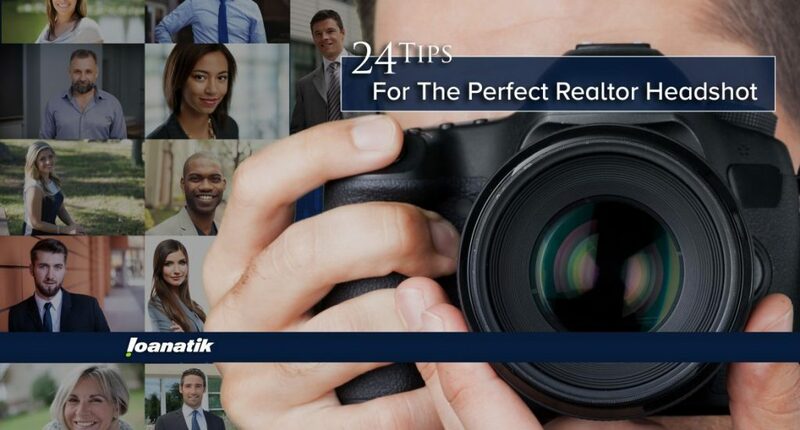 Because we’ve picked the brains of the real estate headshot gods and scoured the latest research on corporate photos, likability, and influence to put together this must-have guide for every modern-day real estate agent. A new research study shows that the most impactful factor in determining how well your headshot comes across is your smile – specifically, when you smile with your teeth showing. PhotoFeeler, a tool for testing profile pictures, used their platform to gather data from over 60,000 ratings of perceived competence, likability, and influence for 800 different profile pics in their database. By the way, want to know the best way to get a natural smile? To avoid the fake grin, think of something funny before you smile. Open your lips just a little as you do it, making yourself appear more approachable. Stare into the Soul of the Camera. You don’t have to look creepy, but viewers are more likely to make a personal connection with you if you have direct eye contact with the camera. Choose an angle where the viewers can see the whites of your eyes and your eyes appear large. Be sure to avoid an angle where you’re squinting or looking off to the side. BONUS: Get Unbiased Feedback… for Free. It’s always smart to get a second… or third opinion before you choose the photo that’s going to be plastered on your business cards, social profiles, listings, etc. You can always ask trusted colleagues and friends for feedback to make sure you choose the most “likable” photo. It’s called PhotoFeeler, and it’s the free platform where all the above research on smiling came from. You can create a free account and upload your headshots to get unbiased opinions from their 60,000 users who anonymously rank your photo in the following categories: competence, likability, and influence. NYC photographer and headshot genius Peter Hurley uses this proprietary technique every single day to make his subjects look even hotter. He says, “fear and uncertainty comes from the eyes.” Nobody wants to hire a scared realtor who isn’t sure they can sell a house… so try squinching your eyes next time. How exactly does one “squinch”? Easy. Just narrow the distance between your lower eyelid and pupil. You’ll not only look more photogenic, but you’ll exude confidence. Accentuating your jawline will make your face more slim and elegant, while avoiding the dreaded double chin. Here’s how you do it: Bring your head toward the camera, pushing your forehead out and down. This makes the skin pull tight around the jawline to create a look you’ll love. Put Your Good Side Forward. Nobody’s face is perfectly symmetrical. You most likely subconsciously have a “good side,” which is the side you part your hair on. Instead of a front-facing photo, angle your good side toward the camera. Ever wish you could sneak into your brain and trick it into making you feel more confident? Well, you can. During her TED Talk, Harvard professor Amy Cuddy explained the powerful link between what you do with your body and how confident you feel. According to Cuddy, putting ourselves in a “Power Pose” literally changes our physiology, releasing a hearty dose of testosterone to fuel our bravery. Confidence means competence in the eyes of your prospects, so here are a few power poses to try before your next photo shoot: Try putting your hands on your hips or raising your arms above your head as in victory. You’ll feel silly, but it will increase your feelings of confidence and power and come across in the photo. Do this before you take your headshots and you’re guaranteed to come across more confident, authoritative, and powerful. It’s wine-thirty somewhere, so go ahead and have that drink (just don’t show up drunk and PLEASE don’t drink and drive!). If you don’t drink, try meditating before the shoot instead. Either way, getting in a more relaxed state will make you look more confident when you go on camera. Peggy Farren, a professional photographer with Naples Portraits, says tilting your head just a fraction towards your lowest shoulder will put off vibes of confidence and authority. According to PhotoFeeler’s research study where they collected and analyzed feedback on over 800 profile pics on their website, nothing paid bigger gains for perceived competence and influence than formal dress. In the study, the people in the headshots featuring formal attire (meaning: a dark-colored suit over a light-colored buttondown + tie for men) were perceived as .94 more competent and 1.29 more influential than those wearing more informal dress. Keep things more formal by avoiding bold or unusual colored clothing, trendy details, and t-shirts and jeans. People connect with people – not robots. So, be YOU. Don’t do anything in front of the camera you wouldn’t do in real life. This isn’t a modeling gig. This isn’t a selfie. This is your professional headshot. On the other side of the same coin, you can do things like holding a cup of coffee in your hand, slipping your hand into your pocket, putting your elbows on the table, and smiling to give your headshot an added layer of authentic humanity. Put Your Zygomatic Muscle in It. If you’re smiles always look fake, here’s another little tip to try: The Duchenne smile. A Duchenne smile contracts the zygomatic muscle, which in turn raises the corners of the mouth and cheeks. You can thank this genuine smile for crow’s feet around the outer corners of your eyes, but it’s also the best way to look authentic in photos. There’s still debates over whether or not you can force a Duchenne smile. But it will help if you go to the shoot in a good mood. Try thinking of a happy memory or funny joke. This will actually trick your brain into feeling happy. It’s easy to feel awkward and vulnerable when you’re just standing in front of a camera. Try sitting down in front of a table with something in your hands. This can put you at ease so you look more relaxed and natural. Wear timeless pieces from your wardrobe unless you are looking to get new head shots every year or two. You can expect that you’ll need to update your photos every 4-5 years, but having classic attire will help keep you from looking dated. Stick with solid colors instead of patterns and choose simple jewelry. Get your hair cut and looking at its best before taking your photos. When in doubt keep it simple. You don’t want anything that’s too loud or personal in taste. Every realtor needs the iconic head and shoulders portrait – but don’t stop there. Make sure you fill up your arsenal with some full body shots and environmental shots as well. These will come in handy for advertising, flyers, billboards, and websites. Also, your images should have consistency in their branding, but you’ll want a few different angles and poses depending on where you are putting your headshot. Just be sure to know your audience. For example, your social media profile might be more informal and friendly while a headshot used for a real estate networking conference should have a more formal and authoritative look. These photos are for your business. A nice picture of you hiking in the woods is not appropriate for your business, no matter how nice your hair looked that day. You do not want photos that are grainy or blurry, or taken with sub-average camera equipment. Your images need to be in a format where they can be sent electronically without resizing issues. Do not take a photo that has other people and crop them out. It will be apparent that you edited out the other people and it will look extremely unprofessional. DON’T use a picture of just your head. Avoid the floating head pictures where all that can be seen is your face. Include the upper portion of your body. DON’T use a stiff pose. Try to look natural and confident in your headshot. This is ultimately up to you. Don’t listen to the voice that makes you uncomfortable in front of the picture. Keep telling yourself that you will take fantastic photos and believe it. DON’T use a photo with shadowing or poor lighting. Make sure your photo is well lit and there aren’t any shadows casting over you. People are naturally drawn to a clear and well-lit picture. Try to utilize natural light to get the best lighting quality for your photos. Although many people feel this is a power pose, it can actually be intimidating and off putting for viewers. To look approachable keep your arms open and at your sides. Hire someone who has previous experience taking business headshots. Ask your colleagues whom they would recommend (assuming they have good headshots). Look for someone with the proper, professional equipment for high-quality photos. Make sure they have software to retouch and edit your pictures. Ask for references of satisfied clients. Look for a photographer open to feedback and will listen to your needs and wants as a client, not a diva. All of us at Loanatik hope you found these tips valuable. After all, your realtor headshot is a key component of your branding, marketing, and success. Remember: It PAYS to take the time to get photos that look professional and likable. So keep these tips in mind before you get your headshots done.